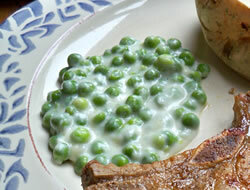 The sweet creamy white sauce made from this recipe is perfect with the sweet flavor of the peas. 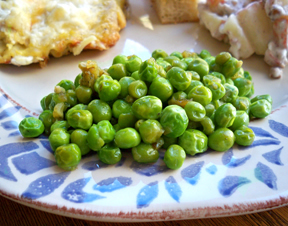 Fresh garden peas would make this recipe even more special. 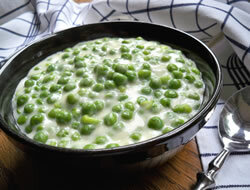 Mix peas, half and half and salt in pot and cook until heated through. Blend 3 tbsp. melted butter and 3 tbsp. flour to make paste and add to peas. Cook until thickened. Adjust salt and sugar to taste as needed. May add more peas to serve more people. Up to 32. oz. of peas. 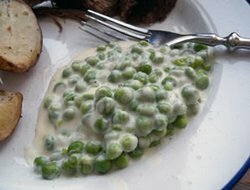 "I had never made creamed peas before trying this recipe. These were so good. The sauce was sweet and creamy. My kids didn't want to try them but I made them at least try them . . . they loved them. I guess I will be making them again."